The average attention span of an adult is eight seconds--eight seconds! That is tough news for a presenter. It means you may have a room full of people, but their minds are elsewhere. You're competing with a slew of activities demanding their attention--email, texts, Facebook, YouTube, chats, and apps, in addition to thoughts about their next meeting and projects that are behind schedule. How do you get a message across in a world like that? The inability to powerfully inform and persuade amid an unprecedented number of distractions is one of the greatest hidden and pervasive costs of the twenty-first-century workplace. Learn to connect with your audience, and you'll stop having unproductive meetings and wasted time. In Presentation Advantage, FranklinCovey outlines its "Connect Model," the mental model that allows you to connect with the message, yourself, and the audience during any presentation by: Structuring relevant and purpose-driven messages Understanding how our brains best synthesize and remember key information Using visuals such as PowerPoint to inspire instead of torture your audience Aligning your message, body language, and tone of voice for a powerful delivery Whether to one person or one hundred, effective presenting is today's top business skill, and the experts at FranklinCovey help you master it. 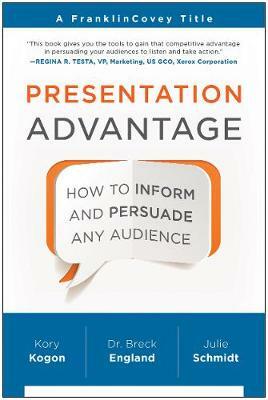 With the Presentation Advantage, you can deliver dynamic, compelling, and truly effective presentations every time.